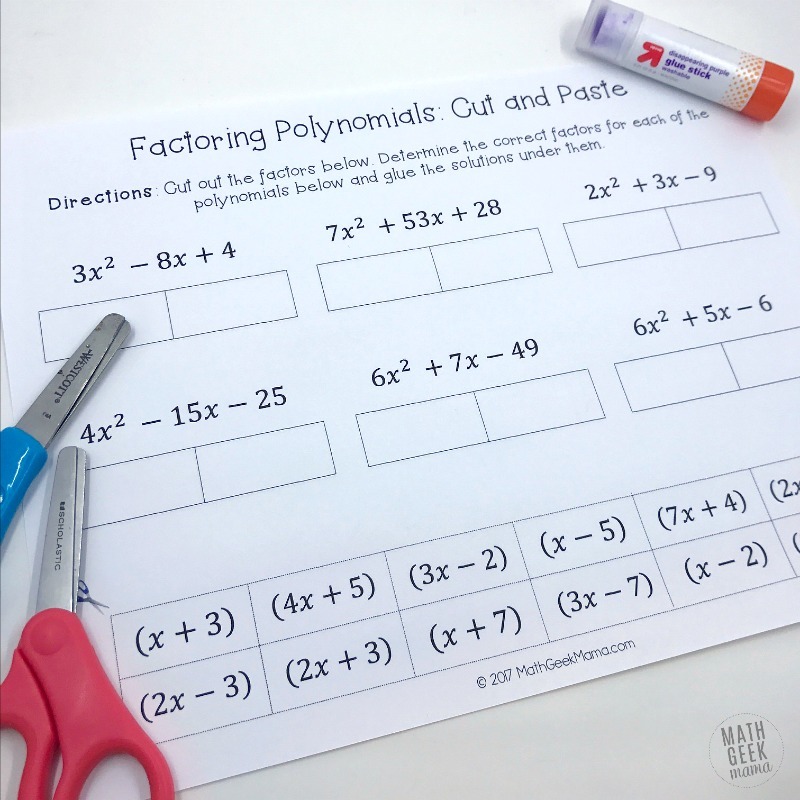 Factoring polynomials is such an essential, foundational skill in Algebra. 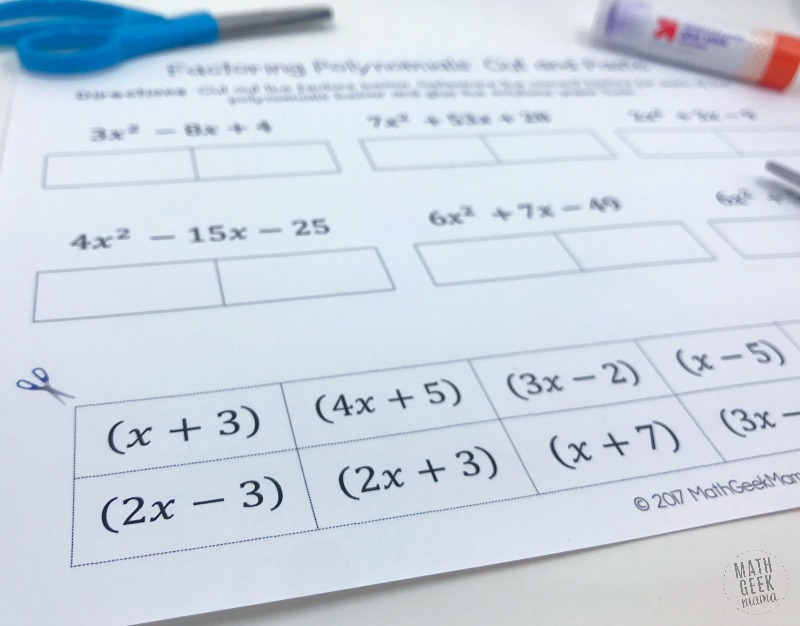 As students move on to more advanced concepts and even into higher levels of math study, they will still need to factor to solve all sorts of problems. So building a strong foundation and providing lots and lots of practice is the key. 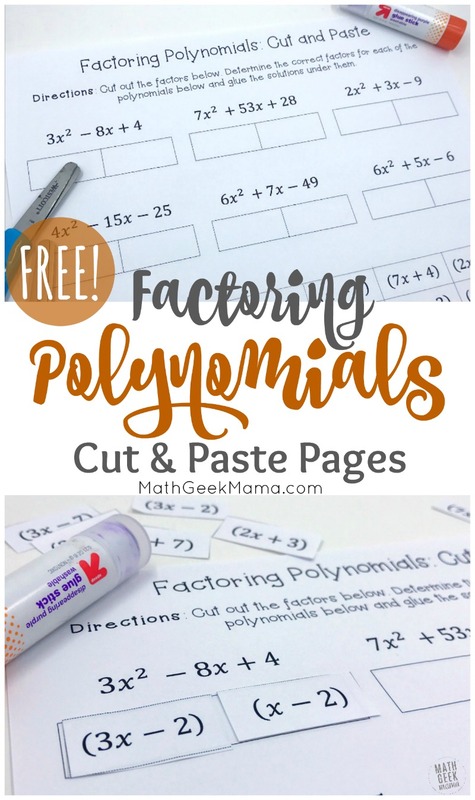 So today I’m sharing a really easy and low-prep way to provide extra factoring polynomials practice using some simple cut & paste pages. When I taught Algebra, I tried to introduce any new concept using simple whole numbers. 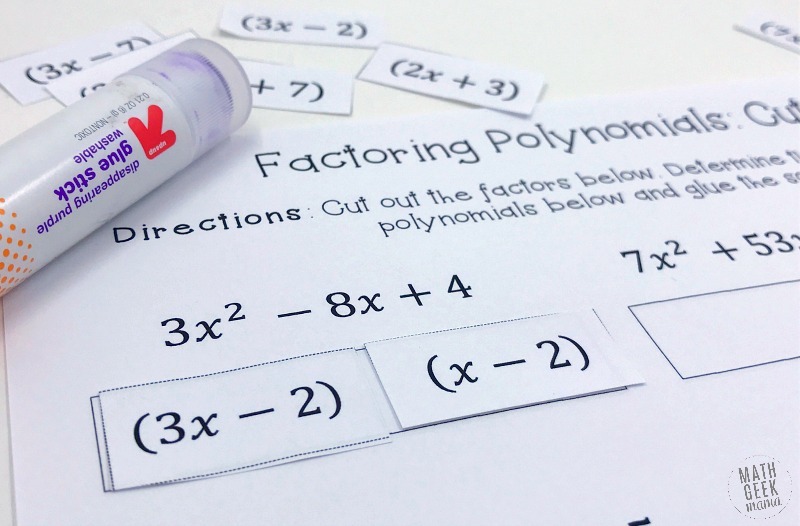 I wanted to remind students of the underlying mathematical concepts so that hopefully they would see how that translates to algebraic expressions with variables. 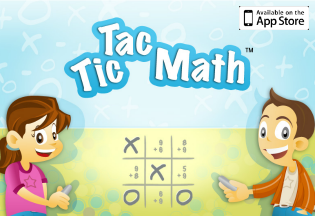 Because the underlying concept of multiplication is the same, whether you have whole numbers, fractions or x + y. So did my students think it was silly for me to remind them how to find the factors of 24? Yes. Did it help them to see that just like 12 x 2 = 24, the factors (x + 3) (4) = 4x + 12? Yes. I would also encourage you to use an area model to visualize multiplication so you can see the factors. Because again, the concept is the same, even when they factors are (x + 3) and (4). To create an area model using variables, I recommend using algebra tiles. 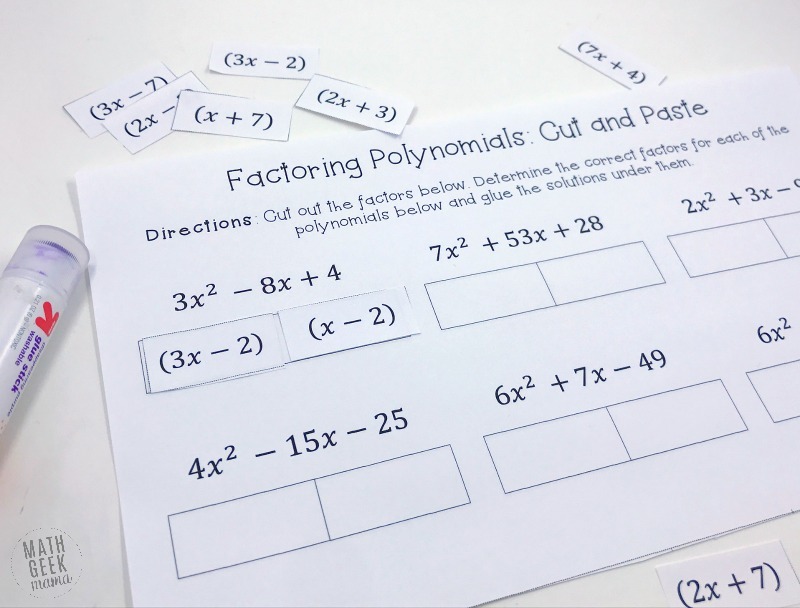 When students are ready to practice finding factors of polynomials on their own, you can pull out these simple cut & paste pages. 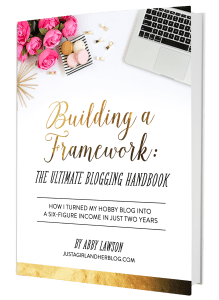 Using these practice pages is fairly straightforward. 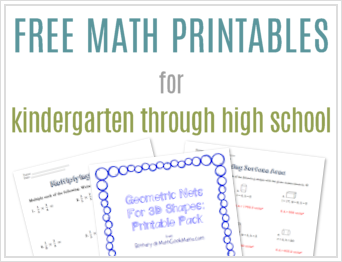 Each page includes a set of polynomials. At the bottom are a collection of factors for students to cut out. They then solve each problem by finding the correct factors and gluing them down below the problem. It also includes answer keys for each page, making this easy for you as well! 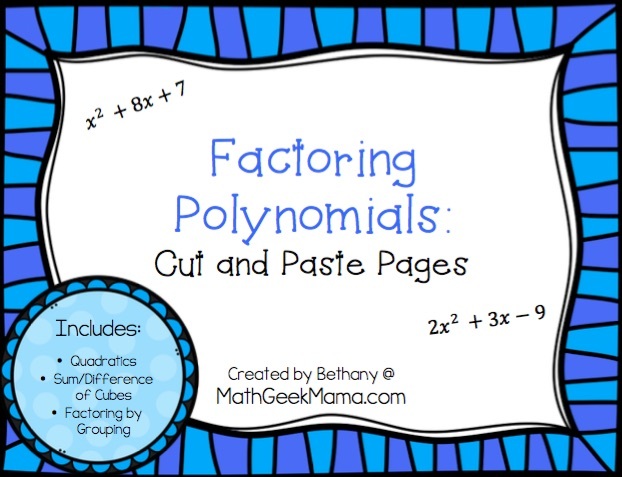 I hope you enjoy this set of factoring polynomials practice pages!